Carrier downloads allow agents to be trusted partners for their clients by ensuring agencies always have the latest policyholder data. Our staff is able to service our customers faster and more accurately. 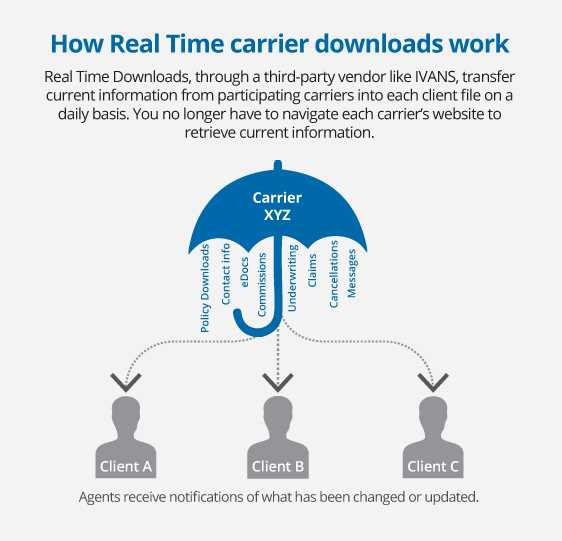 Carrier downloads are crucial to efficient management of your agency. Download Rules is a feature in HawkSoft that lets agents choose if they want carrier downloads to automatically update policies. Most other systems force a policy update. Some agents prefer to review the policy changes before updating. Download Compare is a feature in HawkSoft that highlights policy changes. This makes it easy to review two policies side-by-side and instantly see the changes. Downloads arm agents with the latest policy data. Agents can become trusted partners for their clients. Automatically download policy information across a wide-range of personal and commercial lines. HawkSoft works with IVANS, TEAM-UP, and other third-party vendors to ensure data transfer is secure and accurate. Eliminate cumbersome navigation on each carrier’s website to identify policy changes. Lines of Business available for download will vary by carrier. Real time downloads import the following types of data into HawkSoft's management system with the click of a button. Do your carriers send Downloads? Check if your preferred carriers send Downloads here on our website. If a carrier is not there, we encourage agencies to contact their carrier reps to let them know how much more effective the agency can operate with automation and integrated downloads.